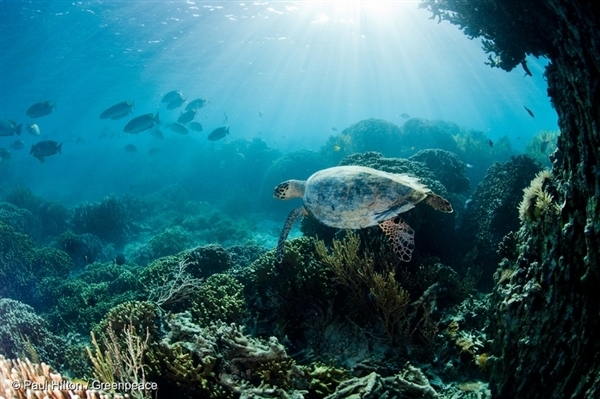 The world has started to develop a new treaty to protect ocean life. And the progress is encouraging! A new ocean treaty in the works right now may help protect two thirds of the world’s oceans and set up rules to create and manage ocean sanctuaries, including in the central Arctic. Greenpeace and other members of the High Seas Alliance were at the United Nations over the last two weeks to encourage bold action for oceans. Now that the first round of negotiations are over, I return home cautiously optimistic that the boat is sailing in the right direction. The last two weeks of discussion were encouraging. I was uplifted by the transparent, and inclusive discussion, by the level of engagement, by the positive and cheerful spirit in the room, by the many laughs and the occasional tears and by the determination of the Chairman – Eden Charles from Trinidad and Tobago – to have a new ocean treaty in place by 2019. The atmosphere was completely different than the informal discussions that have gone on (and on) for the last decade. Some of the governments that for years have been opposing a new treaty, arguing that it was not necessary, have begun to constructively engage in the conversation. It looks like now that the dance floor is open, everyone is ready to rock n’ roll – although some still remain uninspired by the music. After years of questioning whether or not there are problems that need fixing, governments now agree that the status quo is not acceptable and the sector by sector way of governing our ocean, whereby fishers manage fishing and shippers manages shipping, is not working. There is a need for a comprehensive global regime that addresses all impacts on ocean life in an integrated manner, thus filling gaps, complementing and strengthening existing regimes. However, it is still unclear how fishing and other threats will be addressed without undermining the competence of existing governance bodies, and avoiding duplications. Likewise, there was nearly universal acceptance that marine protected areas (which also include fully protected ocean sanctuaries) are effective tools for healthy, abundant and resilient oceans and that we need a global mechanism for creating more of these areas in order to achieve global conservation targets and more. However, uncertainties and differences of views still remain as what that mechanism should look like and who should be responsible for management and enforcement. Without a strong central compliance and accountability mechanism, leaving management in the hand of existing bodies, as many suggest, would not improve the situation that much and might result in the proliferation of paper-parks with little additional value. The contribution of civil society in the run up to and during the meeting has been greatly appreciated and our continuous support has been encouraged. What a difference compared with a few years ago, when we were looked upon with suspicion and sometimes not even allowed in the meeting room! No doubt this won’t be smooth sailing – many difficult issues need yet to be solved – including how to balance conservation and sustainable use. Some countries, like Russia and Iceland, still oppose strong rules that end the Wild West exploitation of the global oceans. However, the first round of talks has generated positive momentum, which will hopefully spur governments to try to find solutions that benefit the oceans, rather than their own interests. But the tears in the eyes of one of the delegates as she reminded us of the words of Sylvia Earle “We must defend the ocean, as if our lives depend on it, because they do,” and the long applause that followed, are a positive signal of the commitment of delegations towards ocean protection. Stay with Greenpeace as we continue this journey and ask world leaders to support ocean sanctuaries at the the next round of talks at the end of August. Once again, we will be there on your behalf to make sure that the boat keeps sailing steadily towards ocean conservation and the spirit of compromise will not affect the level of ambition of this new treaty. We will be there to remind delegates that, as someone said in conclusion of the meeting, we are all on this boat together. We only have one Planet and we cannot make mistakes. If we wreck it, we do not have anywhere else to go. Veronica Frank is a political strategist for Greenpeace International.